Now that you have some basics, you can use them for testing. 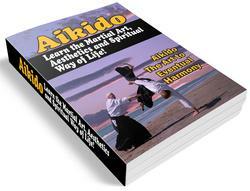 In general, nage (the partner being tested) stands comfortably or sits in seiza. Uke (the partner who will provide the test) stands or sits in seiza perpendicular to nage (the partner who will take the test). 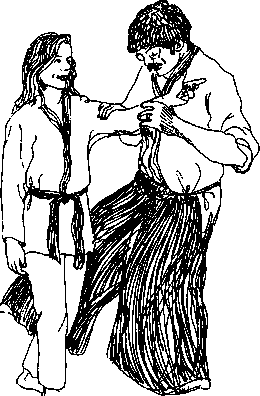 With the palm or fingers of the hand nearest nage's chest, uke applies pressure to nage's chest, perpendicular to nage's chest, fingers parallel to the floor. Pressure is applied until nage begins to lose stability. Uke observes the amount of effort required to disrupt stability. This configuration is intended for beginning nages and for beginning ukes tempted to approach the exercise as a contest; less mechanical advantage makes it harder for uke to bowl over his partner. Uke's fingers are parallel to the mat because the hand tends to follow the fingers. A test done with fingers directed upwards tends to go in that direction — a very difficult test.